coconut oil is excellent moisturizer for all skin types including dry skin without any comparisons. Skin is an organ, like your heart and kidneys are. In fact, it's the largest organ in your body . It is thin, tough and waterproof. This protective shield works to help your body repel damaging bacteria and viruses. Also protects you from the harmful rays of the sun. It does act as your "face" to the world, when it becomes dry or damaged, you can end up looking older than you actually are. So, you should care for your skin, make it healthy to keep your body strong and protected. So, you should care for your skin, make it healthy to keep your body strong and protected. Jano desire skin care products mainly ingredients is coconut oil because coconut oil is excellent moisturizer for all skin types including dry skin without any comparisons. It also delays wrinkle and sagging of skin which normally become prominent with age and also helps in treating various skin problems such as eczma, dermatitis, etc. For environmental friendly reason, coconut trees need not to use pesticide and fertilization. So production of them is very natural. Therefore coconut oil is the best answer to today’s consumer demands for premium, natural and value added products. That why we selected coconut oil based on JANO skin care products. JANO coconut body lotion contain 20% approximately JANO virgin coconut oil, cold-process method producing and coconuts from Southern Thailand. It is easy to absorbed, but prolong moisturizer and get benefits of coconut oil that mean your skin will be younger. It is good for all skin types and use as often as required. Natural soap in luffa bag, natural scrubbing sponge . Luffa fiber helps to scrub dead skin and activated blood circulation, while you natural soap clean and moisturize your skin. This is Thai luffa which give a soft sponge when you wet it, it not too hard for your skin, but very great natural fiber for scrubbing. 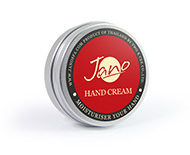 It very good to dispel dry hand and fissure skin, also keep skin feeling soft and smooth. Hand is organ that we always use, it will be strange if your face is young, but your hands is old! Intensive hand cream with Thai flower scent, blend a cold-process vegetable oil with bee wax, natural wax produced in bee hive of honey bees. It very good to dispel dry hand and fissure skin, also keep skin feeling soft and smooth. Apply hand cream after your house keeping and before your bed time in night. While you sleep, hand cream is absorbed to your skin and you will get fast result for treatment dryness. Use every day for your younger looking hand! It very good to dispel dry foot and fissure skin, also keep skin feeling soft and smooth. Don’t forget to take care your feet! 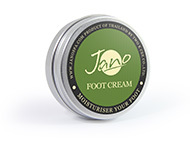 We recommend JANO foot cream to be your feet’s friend. Intensive foot cream with lemongrass and orange essential oil, blend a cold-process vegetable oil with bee wax, natural wax produced in bee hive of honey bees. It very good to dispel dry foot and fissure skin, also keep skin feeling soft and smooth. Apply foot cream in night and for the best result, wear socks to warm your feet. While you sleep, foot cream is absorbed to your skin and you will get fast result for treatment dryness. Lemongrass oil help eliminate odors of feet and orange oil is natural AHA helps to remove dead skin surface. We use fine sea salt blend with premium glade vegetable oil, this salt not too harsh your skin, but it is a good bead for scrub dead skin and help to open pore skin to deep clean, after you finish scrub , just rinse with water, don’t use soap, because you want to keep the oil and aroma oil on your skin, let your skin absorbed oil. coconut oil is excellent moisturizer for all skin types including dry skin without any comparisons. It also delays wrinkle and sagging of skin which normally become prominent with age and also helps in treating various skin problems such as eczema, dermatitis, etc. Aloe vera is great for moisturizing but doesn`t give skin a greasy feel, so it`s perfect for anyone with an oily complexion. Aloe vera can be used to treat sunburn. Aloe vera gel can reduce the pain and swelling you experience during sunburn. It acts as a protective layer on the skin and helps replenish its moisture. When the skin is hydrated, then it will recover faster from the sunburn. JANO ALOE VERA GEL blend with eucalyptus essential oil, which has anti-inflammatory, anti bacterial, insect repellent and it make you feel fresh and clean.